Fertile, well-drained soil or roomy containers that hold moisture well. None. Coleus cannot tolerate cold temperatures. Impatiens and Begonia. Coleus steals the show with its showy foliage. It combines very well with impatiens, another warm-season annual flower. Sow tiny coleus seeds atop moist seed starting mix and gently press them into the surface. Most gardeners buy coleus seedlings, many of which are grown from rooted cuttings. 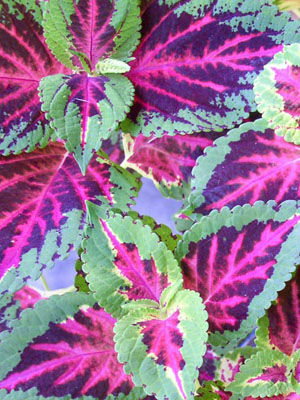 Coleus leaves are often splashed with shades of pink and red that can be used to echo the blossom colors of nearby flowers. Stem tip cuttings are easy to root in moist potting soil or plain water. Pinch back plants in early summer to encourage the development of new branches. Also clip off flower spikes to prolong the life of the plants. Whiteflies are occasional pests outdoors. When coleus are brought indoors to grow as houseplants, they may attract mealybugs.